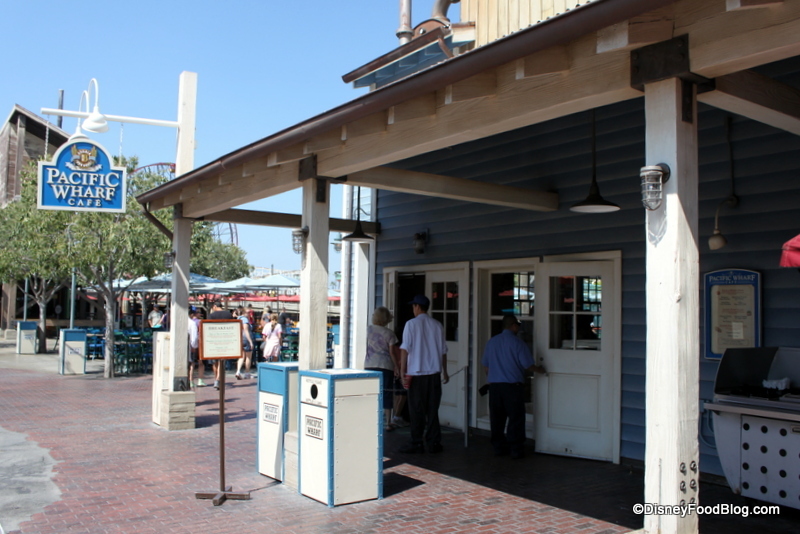 Open during breakfast, lunch, and dinner this cafe is packed full of delicious specialties, charm, and a relaxing view of Paradise Pier. Enjoy fresh baked bread from the famed Boudin Bakery! Breakfast: hot oatmeal, Egg and Bacon Boule served with bacon and fruit, and a breakfast Croissant Sandwich with cheese, egg, & bacon. Lunch & Dinner: Soups served in a freshly-baked sour dough bread bowl; Santa Rosa Corn Chowder, Bakersfield Broccoli and Cheese, Monterey Clam Chowder, and Vallejo Vegetarian Chili. Salinas Turkey Sandwich, Carmel Roast Beef Sandwich, chips, Chinese Chicken Salad, Sonoma Chicken & Apple Salad, and San Francisco Shrimp Louie. Children have the choice of a kid’s turkey wrap or a Power pack (includes string cheese, sliced apples, yogurt, whole grain crackers, and milk or water. A variety of soft drinks, water, milk, hot cocoa, coffee, hot tea, apple juice, & orange juice is also available.